Location was excellent. Staff were very good. We had to book an extra night at the last minute as I'd made a mistake with the dates. They managed to keep us in the same room. Great view of the MURCHISON river from our room. Villa was roomy and comfortable and had plenty of facilities. Loved that we could sit outside on the patio and watch the sunset. We booked two nights in Kalbarri Seafront Villas. The place is easy to find and the checking in was quick and super friendly. Everything was clearly explained to us. The studio apartment (15) was on the first floor and had some views over the river. It had a private balcony. The room was very tidy, quite spacious and was spotlessly clean. The beds were super comfortable. There is a fully equipped kitchen with microwave but no stove. A electric pan is available. There is a aircon and a fan, both worked well. The pool area was tidy, had a sunshade and enough sun lounges. The premises also have bbq’s. I found this apartment very good value for money and definitely will be back. Highly recommended. Great location comfortable very clean room comfy bed. Room was spacious and clean. Well equipped, bed was comfy with ample pillows. Had good facilities, pool was a welcome relief after a long day of driving. Would highly recommend. Room was clean, staff were friendly. View was nice. Great small getaway. Lock in a great price for Kalbarri Seafront Villas - rated 8.2 by recent guests. One of our top picks in Kalbarri.Kalbarri Seafront Villas offers quality holiday accommodation in the heart of Kalbarri. Guests can relax at the sparkling outdoor swimming pool and BBQ areas. Some villas offer sensational river and ocean views. 50 MB of free WiFi or 30 minutes of free WiFi, per device is provided. Accommodation choices here include spacious 1 and 2-bedroom, self-contained units, lovely studios and superb 4 bedroom/2 bathroom town houses. The Murchison River is located directly across the road from the property, where guests can use the dinghy and oars free of charge. You can explore the natural beauty of the local area by visiting the Kalbarri National Park and Murchison Gorge, both a 15-minute drive away. 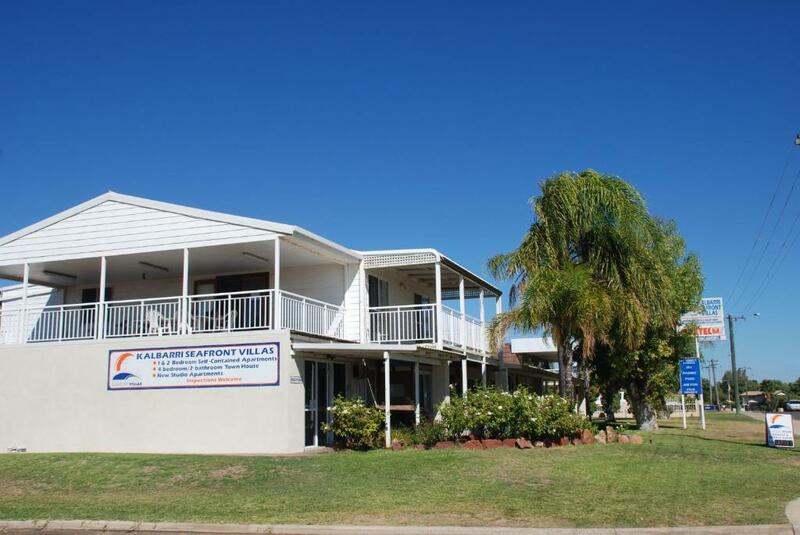 Kalbarri Seafront Villas offers secure off site parking for boats and trailers, with free wash down facilities. Kalbarri Seafront Villas has been welcoming Booking.com guests since 15 Dec 2008. When would you like to stay at Kalbarri Seafront Villas? This spacious, self-contained villa features a queen-sized bed in the 1st bedroom and 2 or 3 single beds in the 2nd bedroom. The ground floor villa also features air-conditioning, a kitchen and a lounge with a flat-screen TV, DVD player and a telephone. 50 MB of free WiFi or 30 minutes of free WiFi, per device is provided. Please note this villa does not have views of the water. This ground floor villa features a bathroom and a separate bedroom with 1 queen-sized bed. The open plan, spacious lounge offers a single-sized bed, a flat-screen TV, DVD player and a telephone. Air-conditioning is provided in the living area and the bedroom. 50 MB of free WiFi or 30 minutes of free WiFi, per device is provided. Located upstairs, this open plan studio apartment features 1 queen-sized bed and 1 single-size bed. It offers a kitchenette with microwave, small fridge, kettle, toaster and crockery. A private en suite bathroom, flat-screen TV, DVD player and a telephone are also provided. Air-conditioned for your comfort, some studios offer views from the private balcony. 50 MB of free WiFi or 30 minutes of free WiFi, per device is provided. Large 2 storey, 4 bedroom / 2 bathroom accommodation with wonderful views of the river & ocean. Fully self-contained with full cooking facilities, private upstairs balcony with BBQ and a telephone. It includes a flat-screen TV and DVD player. Air-conditioned for your comfort. 50 MB of free WiFi or 30 minutes of free WiFi, per device is provided. This spacious fully self-contained villa offers a dining and lounge area with flat-screen satellite TV, DVD player and a telephone. It is air-conditioned for your comfort in the living area and bedroom. Some villas offer water views, from the private balcony. 50 MB of free WiFi or 30 minutes of free WiFi, per device is provided. Spacious, fully self-contained villa with spectacular river and ocean views. Full cooking facilities, with a queen-size bed in the 1st bedroom, and 2 single beds in the 2nd bedroom. Complete with comfortable lounges, flat-screen TV, DVD player and a telephone. Air-conditioned for your comfort. 50 MB of free WiFi or 30 minutes of free WiFi, per device is provided. Kalbarri Seafront Villas is superbly located on the beachfront in the centre of beautiful Kalbarri. Jamie and I have owned Seafront since 1995 and are continually improving our facilities and the services we offer our guests. We are a small property which is very personal and friendly. We are proud of our spacious, comfortable and very clean units. Come and enjoy our sensational water views and stunning sunsets from your Seafront balcony/verandah. Kalbarri is a family orientated town that provides something for everyone. Whether you are looking for action & adventure ( abseiling, sand boarding, surfing, quad bike tours) or simply wishing to relax and enjoy some ME time ( Chinamans Beach, Blue Holes or bush walking) there is something for everyone. Being a compact town you can park your car at your accommodation and walk to quality restaurants and cafes or to the local beach. Fishing is a popular pastime here in Kalbarri either from the beach or by boat. Our staff know some of the local 'hot spots' and are willing to share the info with our guests. House rules Kalbarri Seafront Villas takes special requests - add in the next step! Kalbarri Seafront Villas accepts these cards and reserves the right to temporarily hold an amount prior to arrival. Please note Kalbarri Seafront Villas will not accept bookings where all guests are under 18 years of age. Please note that this property does not have any policies, procedures or resources in place to accommodate the unique needs of school graduates during the annual "Schoolies Week" period. It does not have adequate resources to engage qualified security personnel to guarantee the safety, comfort and convenience of school graduate guests during this period. Please note that this property has a 'No Party Policy'. Please note if any booking is made for school leavers the property has the right to cancel the booking and cancellation fees may apply. For arrivals after office hours, please use your Booking ID or mobile phone number at the check-in kiosk to pay your balance owing and to obtain your unit number and key. After-hours payment is via Mastercard or Visa credit card only. Please advise the property of the number of guests staying in each room. Additional guests not on the original reservation will be charged AUD 15 per person per night. Bathroom and kitchen need an upgrade as looking tired. Had a few cockroaches in the bathroom and the cupboards in both bathroom and kitchen look like they had termite damage. The bed was extra comfy and room was very clean. Air Con in the bedroom did not blow cool air. No help carrying bags up the stairs. No breakfast facilities. WIFI not available in rooms (only 50MB free), at the reception no limit, but upload speed only 50KB/s - unusable. Aircon was old and noisy but did eventually cool the room.